YOUNG Muslims took to the streets of Farnham with brooms and bin bags in hand on New Year’s Day for a community litter-pick. 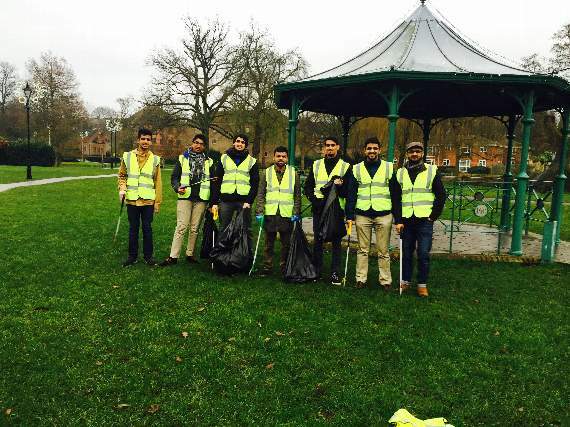 After their morning prayer on Sunday, January 1, members of the Ahmadiyya Muslim Youth Association (AMYA) based at Islamabad in Tilford gathered at Gostrey Meadow to help clean the town’s streets after the new year festivities. The ‘Big Street Clean’ campaign is one of many charitable and community initiatives carried out by the AMYA across the winter break. Atta Quddus, AMYA youth leader for Sussex, Surrey South and Hampshire said: “Our members have enjoyed living in Sussex, Surrey and Hampshire for decades and so any opportunity to help our local community is much welcome. Share the post "New Year’s Day clean-up"